Select your favorite accommodation in Rebun Island (Rebuntou) from a variety of hotels, bed and breakfast places, pensions, and a youth hostel. 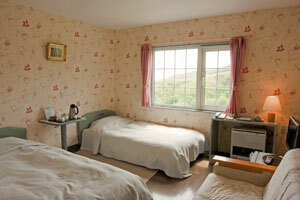 This page introduces accommodation options (hotels, B&Bs, pensions, and the youth hostel) in Rebun. 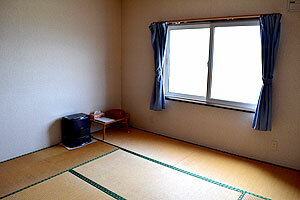 Please look for the kind of accommodation that suits you. 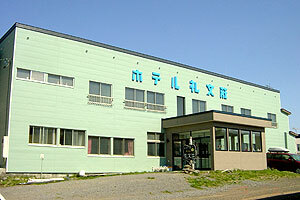 Kafuka is in the southern part of Rebun Island and there is a ferry terminal here. Close to the port of Kafuka, the center of Rebun sightseeing, you can enjoy perfect views of Rishiri-Fuji, a beautiful mountain on the neighboring island. The summer season in Rebun is blessed with an abundance of fresh seafood indigenous to Rebun. Don’t miss the button shrimps (prawns, Latin name: Pandalus nipponensis) and sea urchin. 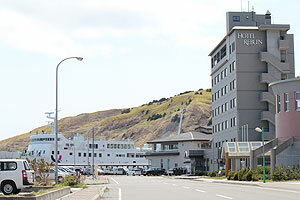 Whether for sightseeing or business, Hotel Rebun is popular among tourists because it is conveniently located in front of the Kafuka Port. Rishiri Fuji visible in the morning sun and the golden sunset from the panoramic hot spring will thrill you in splendid comfort. 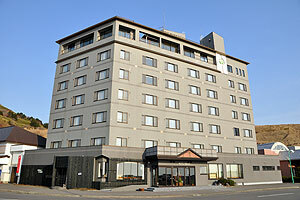 All of us, together with the pretty flowers blossoming in Rebun, look forward to seeing you at our hotel. 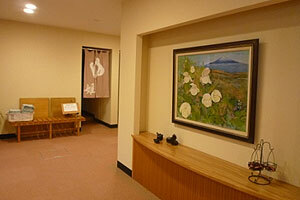 Welcome to Hana Rebun, a Hanakairo-no Yado, featuring flowers and with a distinct Japanese atmosphere. The northernmost traditional inn in Japan famed for its hospitality faces the majestic Rishiri Fuji, appearing to float on the sea, an inn that will touch the heart of travelers showing off the different seasonal beauty of the sea, the sky, and fields of indigenous plants. 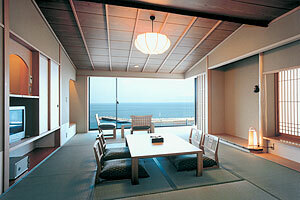 panoramic grand hot spring views from the open-air bath (separate for women and men), restaurant, lounge, shop. Some guest rooms have private open-air baths. All the rooms have private bathrooms. 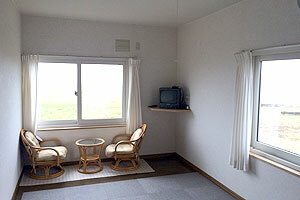 Enjoy your vacation at a small pension in Rebun, the northernmost island in Japan. After enjoying the splendid landscape and unique flowers gifted by the extreme northern nature, you can relax at our comfortable hotel, where the at-home atmosphere will make you feel like staying at a second home. Enjoy the hospitable service with our sea food cuisines exclusive to this northern sea area, including fresh sea urchin (best from May to September). 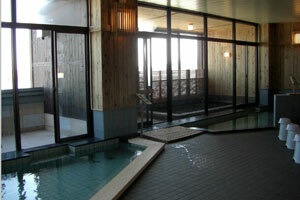 We do not have our own hot spring, but provide pick-up services to and from the nearby public hot springs. 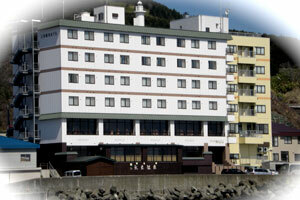 With us you will enjoy your vacation at the very best resort on the northernmost island of Japan. 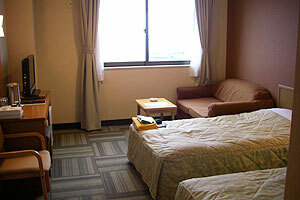 ※Prices include two meals per night and service charges, but not tax. 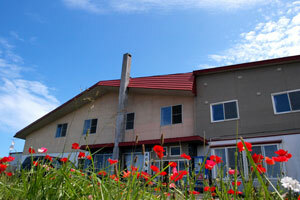 Experience the northernmost nature at Rebun. The alpine plants blossoming everywhere lets you listen to the voices of these graceful eye-catching flowers. We are looking forward to seeing all you, lovers of flowers, here at Hana Shin. 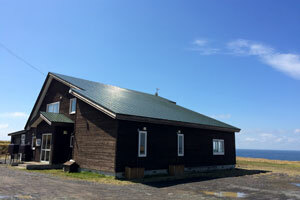 Hotel Rebunso is an at-home inn located in the Funadomari area in the northern part of the island. Relax yourselves enjoying the singing of uncountable birds at Kusyuko (lake Kusyu) in the early morning and the sunset at Sukoton cape, the northernmost point of the island. We provide a delicious cuisine of fresh seafood from Funadomari Port, a town known for its fishery. 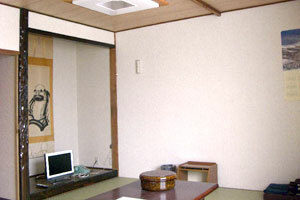 Minshuku Kaido is an at-home B&B managed by a family in Funadomari-mura, in the northern part of Rebuntou. 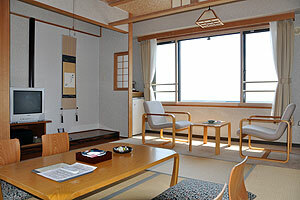 Located on a quiet hill where you can enjoy the scenery of the Sukoton cape and Todo Island, floating on the sea spreading out at the front of Minshuku Kaido. 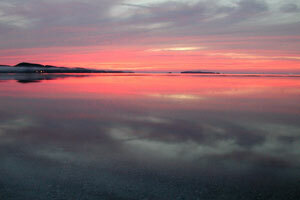 The views and the landscape around the hotel is admired by the guests, and you should not miss the sunset views at dusk. 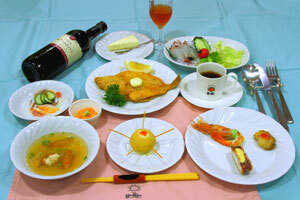 We also offer Japanese cuisine with the local fish, served in a variety of dishes. 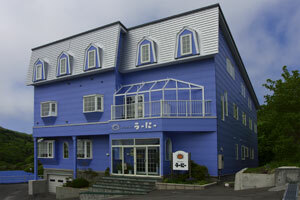 We are far from the Ferry Terminal, and have a free pick-up service between the Ferry Terminal and our hotel. For those planning to tour the capes in the northern part of Rebun, including the Sukoton and Sukai capes, our hotel will suit your needs perfectly. Our friendly staff looks forward to seeing you. When you inquire about Rebuntou with us, we ask that you use simple English, speak slowly (and clearly), and maybe keep a Japanese dictionary handy for consultation. Please note that when you pay with cash, we accept Japanese Yen only. Copyright©2014 Rebun island Tourist Association. All rights reserved.